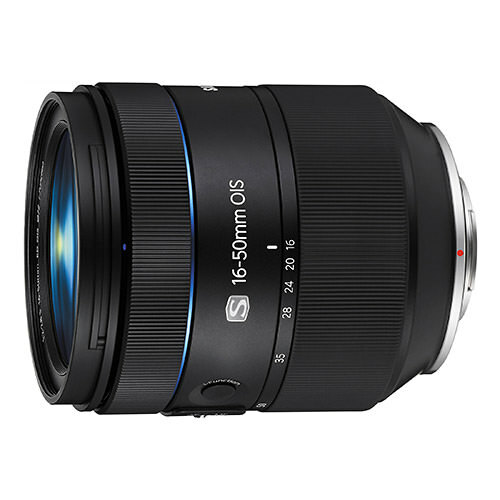 Lens Description: The 16-50mm f/2-2.8 S ED OIS Lens from Samsung features the NX mount and is the first model in their Premium "S" Series. It offers a 35mm-equivalent focal length range of 24.6-77mm, covering wide-angle to portrait-length perspectives. Its fast f/2.0 - 2.8 maximum aperture enables effective low-light shooting and shallow depth of field, and the 9-blade circular aperture diaphragm creates a pleasing blur in the out-of-focus regions of your images. The lens can be stopped down to f/22. The 16-50mm consists of 18 elements in 12 groups, including 3 aspherical, 2 ED (extra-low dispersion) and 2 XHR (eXtreme High Refractive) elements for exceptional clarity, detail and sharpness. Additionally, optical image stabilization counteracts motion blur for clear shots. The Ultra-Precise Stepping Motor (UPSM) improves upon the conventional Stepping Motor (SM), offering three times the precision in its ability to focus on subjects. As an added bonus, the lens is dust and splash-proof for extra durability.